KING RECORDS - was an American record label, started in 1943 by Syd Nathan and originally headquartered at 1540 Brewster Avenue in Cincinnati, Ohio. It now operates as a reissue label for its past material. At first it specialized in country music, at the time still known as "hillbilly music''. King advertised, "If it's a King, It's a Hillbilly - If it's a Hillbilly, it's a King''. One of the label's most important hits was "I'm Using My Bible For A Road Map" by Reno and Smiley. Important recordings in this field were done by The Delmore Brothers and Wayne Raney featuring their close harmony vocals, harmonica, electric guitar and string band playing. The Delmores also did their country boogie material on this label which was a precursor to rockabilly. King ventured into the rockabilly genre and several King artists such as Bill Beach are in the Rockabilly Hall of Fame. Beach's song, "Peg Pants" also experienced success during the European resurgence of rockabilly in the late 1980s. Likewise, singer-pianist Moon Mullican recorded a country boogie style that was a precursor to piano-based rock and roll. Major country hits on the label included "I'll Sail My Ship Alone", "Blues Stay Away from Me", "Chew Tobacco Rag", "Eight More Miles To Louisville", "Sweeter Than The Flowers" and "Cherokee Boogie". The company also had a "race records" (African American) label, Queen Records (which was melded into the King label within a year or two) and most notably (starting in 1950) Federal Records which launched the singing career of James Brown. In the 1950s, this side of the business outpaced the hillbilly recordings. King Records was highly successful after the hiring of Ralph Bass and recorded rhythm and blues artists like Joe Tex, Valerie Carr, Roy Brown, Jack Dupree, Otis Williams & the Charms, Hank Ballard & the Midnighters, Ivory Joe Hunter and Johnny "Guitar" Watson. They also had a long legal battle with James Brown, after he repeatedly violated his King contract. King also bought out several other record labels, including De Luxe Records (in 1952), and Bethlehem Records. One of the most successful features of the label was its encouragement of the mixing of the country and rhythm and blues sides of the label. Many of the label's country singers such as Moon Mullican, Delmore Brothers, Hawkshaw Hawkins and Zeb Turner covered many of the label's rhythm and blues songs such as "Grandpa Stole My Baby", "Rocket |To The Moon", "Bloodshot Eyes", and "I Got Loaded". Also, some of the rhythm and blues artists also provided pure country songs such as Bubber Johnson's "Keep A Light In The Window For Me", which was recorded by Johnson and made famous by Moon Mullican. Likewise, rhythm and blues artists covered bluesy country artists' songs such as Wynonie Harris's covers of "Triflin' Woman Blues" and "Bloodshot Eyes". During the 1950s, King also distributed their own line of portable phonographs. King Records was unique among the independent labels because the entire production process was done in house. That included recording, mastering, printing, pressing and shipping. This gave Nathan complete control so a record could be recorded one day, and shipped to radio stations the next day in quantities as few as 50. That explains why non-selling King records became so rare. When Nathan died in 1968, King Records was acquired by Hal Neely's Starday Records and relaunched as Starday and King Records. The legendary songwriting duo Jerry Leiber and Mike Stoller bought the label in 1970, but sold it soon afterwards to Lin Broadcasting which in turn sold it to Tennessee Recording and Publishing, owned by Freddy Bienstock, Hal Neely, Jerry Leiber and Mike Stoller; who sold it in 1974 to Gusto Records. In 1971, James Brown's recording contract and back catalogue were sold to Polydor Records. Since 2001, Collectables Records has been remastering and reissuing the King Records catalogue. Several compilation CD's are available featuring King Recording Artist, specifically "King Rockabilly", released in 2004. King Records is now only used as a record label under the parent company, Gusto Records. The former King Records headquarters at 1540 Brewster Avenue in Cincinnati is still standing. It has an historical marker placed by the Rock and Roll Hall of Fame in 2008. 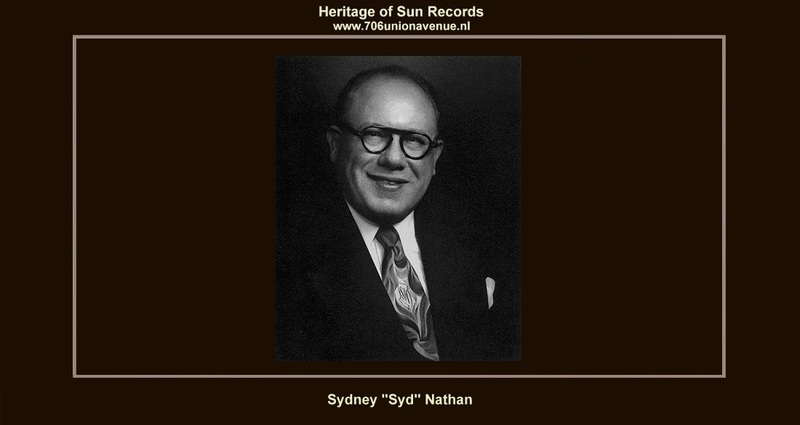 SYDNEY ''SYD'' NATHAN – was an American music business executive, who founded King Records, a leading independent record label, in 1943. He contributed to the development of country and western, rhythm and blues and rock and roll music, and is credited with discovering many prominent musicians, most notably James Brown whose first single "Please, Please, Please" was released on the subsidiary label Federal in 1956. Nathan was described as "One of the truly eccentric figures of the record industry... who ruled his label like a dictator... and constantly screamed and intimidated his artists and employees". He was posthumously inducted into the Rock And Roll Hall of Fame, in the "non-performer" category, in 1997. Brewster Avenue in Cincinnati, home of King Records for the next 25 years. He also set up his own recording studio on site and made his own distribution arrangements across the Midwest rather than relying on national companies. Nathan set up the Queen label to record rhythm and blues artists in 1945, but it was soon absorbed within the King label. Over the years, King assimilated many other smaller labels, including DeLuxe, and set up several subsidiaries such as Federal. The company's talent scouts found many future recording stars. Early signings to the King label or its subsidiaries included Bull Moose Jackson, Lucky Millinder, Tiny Bradshaw, Earl Bostic, Eddie "Cleanhead" Vinson, Wynonie Harris, The Dominoes, Little Willie John, Bill Doggett, and Hank Ballard and the Midnighters, whose song "Work With Me, Annie", was one of the label's biggest successes. Nathan successfully recorded country performers such as The Delmore Brothers, The Stanley Brothers, Moon Mullican, Cowboy Copas and Grandpa Jones, and also gospel singers. He actively encouraged white performers to record rhythm and blues songs, and vice versa, not as a deliberate attempt at integration but as a way of maximising his song publishing revenue. Nathan said: "We saw a need. Why should we go into all those towns and only sell to the hillbilly accounts? Why can't we sell a few more while we're there? So we got in the race business''. According to his citation at the Rock and Roll Hall of Fame: "In the process of working with black rhythm and blues and white country artists, Nathan helped effect a cross-pollination of the two worlds, thereby helping lay the groundwork for the musical hybrid known as rock and roll''. In 1956, talent scout Ralph Bass signed James Brown to King, and recorded "Please, Please, Please". Nathan reportedly commented at the time: "That's the worse piece of crap I've heard in my life. It's someone stuttering on a record only saying one word....". However, the record was a success. Although Nathan and Brown had a volatile relationship over the years, Brown later said of Nathan: "I would be telling a lie if I said I would be a world star without the help of men like Mr. Nathan. He was the first one willing to take a chance on me''. Brown continued to record for King, despite occasional lawsuits between the two and Nathan's initial refusal to fund Brown's album Live at the Apollo, recorded in 1962, which was one of his most successful and influential, reaching number 2 on the United States album chart. King Records was noted as one of the first racially integrated companies in the United States record business, and as "one of the few recording companies to make a record from start to finish, all under one roof''. This gave the company a strong competitive edge, allowing songs to be recorded, pressed, and distributed within a week. By the 1960s, it had become the sixth largest record company in the United States and was responsible for over 250 hits on the rock, pop, rhythm and blues and country charts. However, King's impact declined in the 1960s, after Nathan was implicated in the payola scandal. In addition to credits received in his own name, Nathan used the pseudonym Lois Mann for song publishing and copyrights in order to obtain a share of the songwriter royalties, as was common record company owner practice. "Syd Nathan", "Sydney Nathan", and "Lois Mann" are each credited with the same 202 song titles, including "Annie Had A Baby", "I'll Sail My Ship Alone", "Signed Sealed And Delivered", and "Train Kept A-Rollin'". Nathan had longstanding health issues, and heart problems began to emerge during his fifties. He died of heart disease and complicated by pneumonia om March 5, 1968 in Miami, Florida at the age of 64. He was buried at the Judah Touro Cemetery in Cincinnati. Sydney ''Syd'' Nathan was posthumously inducted into the Rock And Roll Hall of Fame in 1997, and the Bluegrass Hall of Fame in 2007.